Deb has read 4 of 10 books. ‘Where Can We Have The Party?’ is Deb Hockenberry’s debut children’s book. She has always wanted to write stories for children, and has taken multiple courses from The Institute of Children’s Literature and is a member of The CBI Workshop to keep with the ever-changing world of children’s writing. She has also been published in several online magazines. To ask Deb Hockenberry questions, please sign up. Where Can We Have the Party? 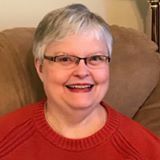 Deb Hockenberry's Blog: Kidlit and More! What writing advice can Mr. Rogers give? Fred Rogers gave us some very good advice throughout the airing of Mr. Rogers Neighborhood. But did he give any advice that can be used by writers? You bet he did! I found this video on Facebook and got permission from writersrelief.com to place it on KidLit and More for you. After their permission note, is the video with the wise advice. We’d love your help. Let us know what’s wrong with this preview of Mrs Pettigrew Sees a Ghost by Katherine Hayton. We’d love your help. Let us know what’s wrong with this preview of How To Self-Publish A Children's Book by Yvonne Jones. We’d love your help. Let us know what’s wrong with this preview of Never Binge Again by Glenn Livingston. We’d love your help. Let us know what’s wrong with this preview of How to Self-publish and Market a Children's Book by Karen P Inglis. We’d love your help. Let us know what’s wrong with this preview of Break Through Your BS by Derek Doepker. This delightful explanation of the Indian festival called Holi is a must have for your home library. ‘Let’s Celebrate Holi’ has beautiful, bright pictures in it that your child will delight in. The pictures show the old traditional dress of Indian ro This delightful explanation of the Indian festival called Holi is a must have for your home library. ‘Let’s Celebrate Holi’ has beautiful, bright pictures in it that your child will delight in. The pictures show the old traditional dress of Indian royalty, so he/she will learn this without knowing it. The text is simple enough for your child to grasp and understand. The story is very relatable so a child can understand it. Asking Grandma a question and she answers with a story. Or playing with your friends and getting filthy, getting presents, and singing songs like it’s Christmas! Deb is starting Sell Books and get PAID doing Author School Visits: I'm still reading this. She has read 4 books toward her goal of 10 books. “The worst handicap you can have is a lack of belief in yourself! Welcome to the Altoona Area Public Library's Goodreads Group page! We'll be hosting online book clubs and discussions to help fit into busy lives. I see you have horror, paranormal, mystery, thriller, suspense and crime on your "Favorite Genres" list. My novel, Ash: Return Of The Beast (Kindle) weaves all of the above into a dark tale of revenge steeped in the occult. If this is your cup of tea, and If you have the time, you might like to check out the illustrated audio/visual narration series I've created to promo the book. Each of the 4 "Episodes" is about 20 minutes long.